I cheated and got on the scale toward the end of last week. I was feeling leaner and wanted some encouragement – and I was excited to see the scale announce 128 lbs. I have been following the TWC rules pretty strictly, so was proud of the progress in just about 2 weeks and feeling hopeful that another 3-4 lbs. would be next. We had a lovely dinner party on Saturday night and I took that as my free day. I stuck with TWC rules for breakfast, lunch and snack, and kept my eating under control at dinner. Although I had some cheese, white flour tortillas and rice, I didn’t overdo the food. I did, however, drink more than I planned to – including a margarita, beer and wine throughout the evening! The next day I go back on track easily and earned the maximum points for nutrition. I was hoping no harm was done, but sure enough, the scale this morning said 130 lbs.! I think my body doesn’t believe that I am trying to lose some weight and so is making it hard to let go of every ounce it has made friends with in my body. I am determined to see if I can “make it stick” this week. I have plans again next weekend but am going to try to stay on course to avoid the same thing happening. However, this makes me afraid that when the TWC ends in 2 weeks not only will I not have achieved my weight loss goal, but those friendly pounds will find their way back. I think I will need to extend the TWC and commit more strictly healthier habits for the longer term if I am going to keep off any weight I am able to lose. I really just want my jeans to not be tight now that fall weather is here! The Lifestyle Goal last week was to limit social media to 5 minutes a day, and to avoid screens during meals. I didn’t struggle with this too much – I have already cut back on social media and don’t spend much more than 5 minutes most days. I DO enjoy looking at my iPad or phone while I am eating alone, so that was a bigger challenge for me, and I did forget a couple of times and lost the point for the day. Fitness is never an issue for me, but I have definitely cut back on the intensity and endurance of my workouts. I am trying to put more “Oomph” into it – I have a lot of minor aches and pains that I use an excuse but think I need to push through. I went for a really nice bike ride at 9 am one day last week. I still got up early, did an online course and then took time for the bike ride mid-morning. It was a beautiful day and I was glad I did it! I continued the Yoga For All with Adriene and also enjoyed that. It was best for me to do these at night as a “wind down” activity. The Yoga For All series ended today, but I will still use Adriene’s vast collection of videos to keep some stretching in my routine. This week, one of the Lifestyle goals is Breathing, which reminds me I have neglected mediation for the past week or so. 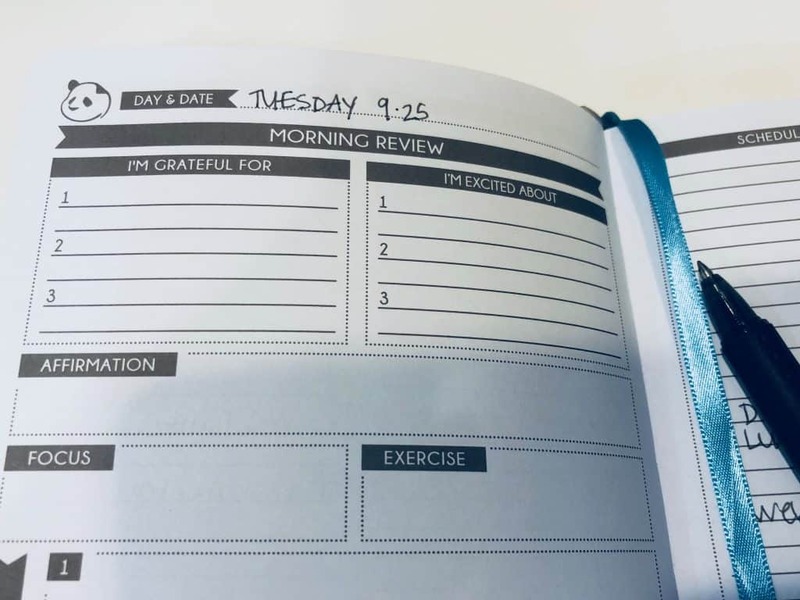 I am hoping to bring that back into my routine this week, along with continuing to write down 3 things I am grateful for each day (part 2 of the TWC Lifestyle Challenge this week). I love using my Panda Planner and starting each day thinking about and noting what I am grateful for. Ultimately, I realize 5 or 6 lbs. is not something to get down about – I am healthy and have so many things to be grateful for!